I had to return this Item because I was sent the wrong size(Honest Mistake) The person at Overstock was very nice and helpful. We got the problem resolved, and the new coat is on it way. 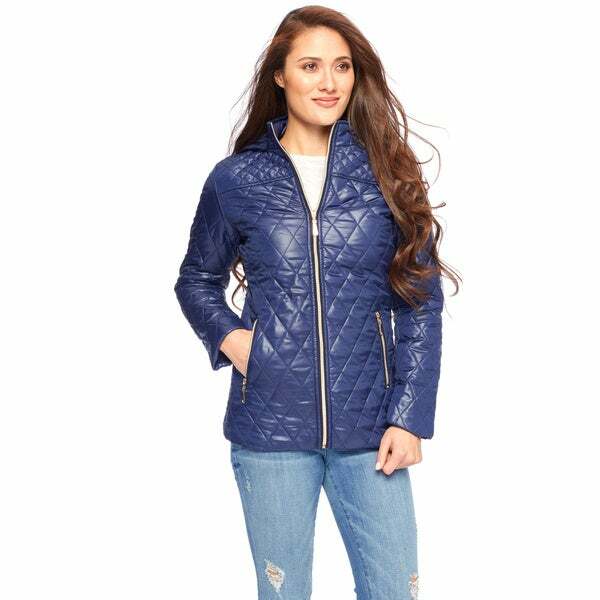 Embrace the cold with this chic and lightweight puffer coat. Secured with a practical front-zip closure, this coat includes a detachable hood that protects your head and hair against the elements. Dimensions 10.0 In. X 5.0 In. X 1.0 In. I searched high and low for a puffer coat that was wellmade and didn’t make me look like I was a tree trunk. I was nervous about buying online but when I exhausted all other local options, I ordered this coat. LOVE IT!!!! So glad I bought this! PS, I have a long torso and this was a perfect fit! jacket ordered was large, but would fit a small person. not well constructed. This jacket is wide in the shoulders and tight around the hips.I am 5'4 and 120 p,had size 4.The hood is too small, barely can cover the head and falls back. Recently I noticed that white fibers from inside the jacket started to go out, not a good sign that it will last much. I bought this coat for my daughter and she truly loves it. I read the reviews before lacing my order, and I made sure to order a size up bc there were some reviews indicating that the size runs small. I ordered an XLarge as I fall between a medium and large at times. It fit nicely in the shoulders, but super snug around my hips, and then I feel like I am swimming around my waist. Just a weird fit all together. It is nice and warm though. The Royal Blue looks great!!! So as long as you don't care that it is not very flattering, then I suppose it's not bad. Great little light weight coat. Seems to run a little small. I had to order one size up. Looks good on my teenager, she says it's good for mild winter weather. .
It’s not a true XL would fit a size medium fine ! This is a very warm, packable, and water resistant jacket. It is also very stylish. The only complaint is that the hood has no drawstring or elastic, so it will not stay in place in windy conditions. Very nice- order as described. I love the coat but I ordered a large and was sent an extra large. No way can I ever wear it.